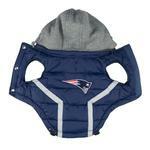 Dogs stay warm while TAILgating for their favorite team in the New England Patriots Dog Puffer Vest! 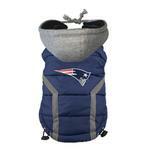 Show off your team spirit this season with the New England Patriots Dog Puffer Vest. This vest has an embroidered team logo on the water repellent quilted shell. Soft fleece interior will keep your pup warm. 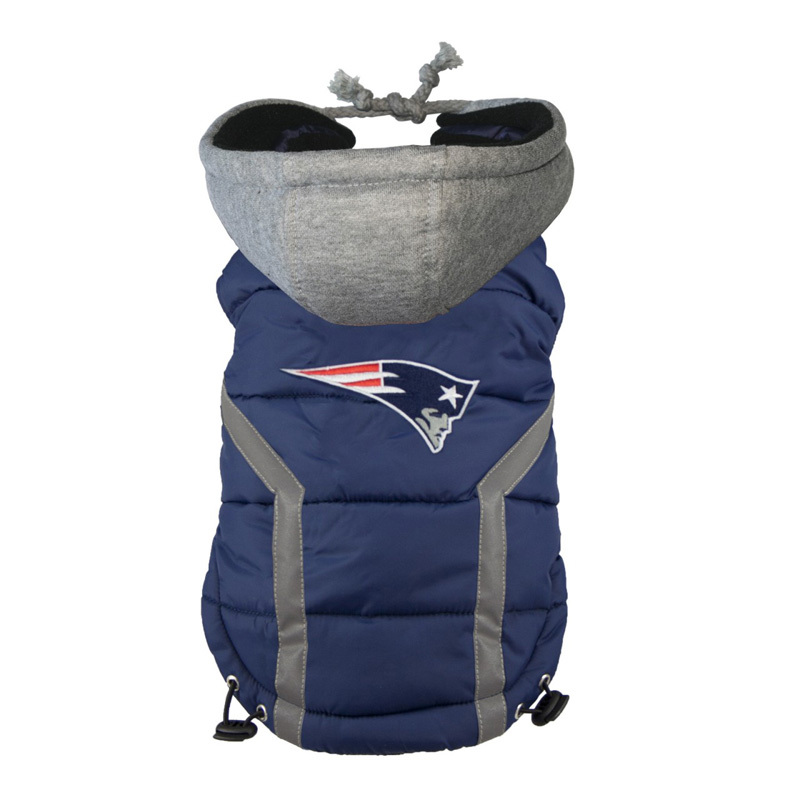 Extra features include the reflective safety stripe, removable fleece hood (zipper), toggle Adjustment, sleeveless vest style, with a touch fastener closure. Who won the Super Bowl 5 times? The Patriots !! Posted On 03/02/17 by michelle c from Waunakee, WI Yes, michelle c recommends this product! Love this ! Very well made, very high quality, looks like a real puffer coat that a person would wear. Great details, and not too puffy which is what I wanted. I bought a sz medium for my 5 lb maltese because the measurements seemed to indicate they ran small, but this was too big, exchanged for a size small. You won't be disappointed. Posted On 09/17/15 by Linda C from Riverside, RI Yes, Linda C recommends this product! Good quality and fit. Seems like it will be nice and warm for the cold winter. My husband loves it !! Posted On 11/26/14 by lita from Edgartown, MA Yes, lita recommends this product! Posted On 11/14/14 by Michael G from Salem, NH Yes, Michael G recommends this product! Max has just become the Patriots newest fan. The jacket looks like it was tailor-made for him. Great products at great prices. Fast shipping, why go anywhere else?